It was 6 p.m. when the devil walked into my office and had a seat. Bounty hunter Victor McCain always wondered how his brother, Mikey, went from down-n-out loser to one of Louisville's richest men. Now he knew: his brother sold his soul to the devil. And in 24 hours, Mikey would die and spend eternity in hell unless Victor agreed to hunt down a thief, a woman as deadly as she is beautiful. On a journey of murder and betrayal, Victor must now put his own soul at risk to save his only brother, battle a dark underground organization with the goal of nothing less than global war between Christians and Muslims, and fight creatures from man's darkest nightmares. Then there's the Hand of God, God's own bounty hunter. In the end, will he be friend or enemy? Only heaven knows. At first, after listening to a couple of paragraphs, I thought, "This was a bad choice. I don't think I can listen to this. It's so poorly written." It was about that time I discovered that the book is set in Louisville, KY. I lived in Louisville for several years with my husband , who was from near there. Though we no longer live there and my husband as passed away, I always loved the city. Listening to this story reminded me of my husband so much. It was like taking a tour of Louisville. All the places, streets and buildings, are real. You can go to Google maps and find them. The story was kind of preposterous and the characters overblown and exaggerated. But the places are spot on. If you miss Louisville, or just want to visit, this book's for you. Otherwise, I can't really recommend it. I suppose book two might be better. If it's also set in Louisville, I might read it, too. I miss the place. This is local for me, which got me to reluctantly listen, but the story was excellent and I binged this title in a day. Reminds me a bit of Constantine/the strain. 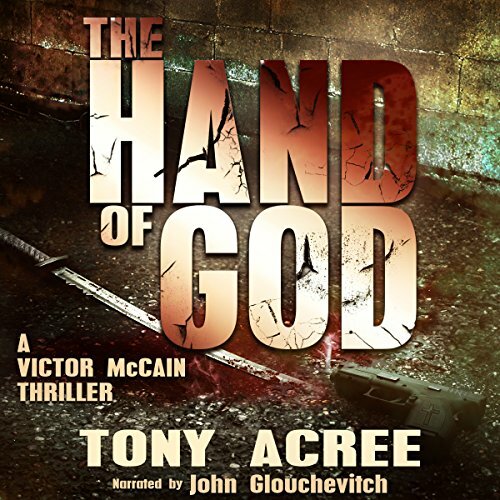 Would you listen to The Hand of God again? Why? The story is very fast paced and you can miss hints if you are not paying attention. I've listened to a few passages again already. What was one of the most memorable moments of The Hand of God? The sequence that takes place on the farm and the main character and others gets surrounded in the barn. What do you think the narrator could have done better? I think the narrator should pick up their pace during the action sequences. This would add tension and a sense of the speed at which the action takes place. When I'm reading a book, I find myself reading faster during action sequences. I love how the dark moments are laced with humor. What other book might you compare The Hand of God to and why? I would compare this to the Jack Reacher series. The strong tough guy against the rest of the world. The supernatural twist just adds to the story! Very pleased. This books author is now one of my favorites. "I was given this free review copy audiobook at my request and have voluntarily left this review." Awesome book, pleased to have found it. Very well written and reminds me a lot of Jim Butcher. I recommend this book to all thriller fans.